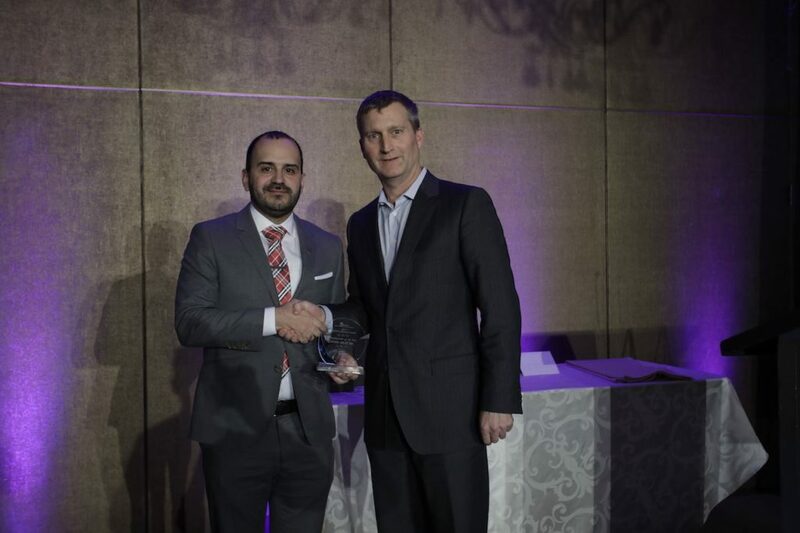 Executive Director, Matias de Dovitiis presenting Manufacturer of the Year to Silfab Solar Inc.
On February 2nd, we collaborated with the Ontario Sustainable Energy Association (OSEA) for their 7th Annual Powering Prosperity Awards hosted at the Montecassino Hotel. We worked with OSEA and Wasser Resources to create a networking event for the members of DUKE Heights BIA prior to the awards, where our members could meet with sustainable energy leaders from across the province. This was an excellent opportunity for our members, who learned more about sustainable energy alternatives being used for greater economic success within the business community. Following our networking event, DUKE Heights was able to participate in the Powering Prosperity Awards by presenting the manufacturer of the year award to Silfab Solar Inc. Silfab Solar is a Mississauga based company who have risen as leaders in the development, manufacturing, and distribution of ultra- high efficiency PV modules (solar panels). Through their customized North American products, Silfab contributes over 300 megawatts of solar panels which produce pollution free, clean energy that is put back onto the grid. Silfab was just one of the many companies recognized during the awards for their contributions to the sustainable energy scene in Ontario, for more about the winners visit https://www.ontario-sea.org/page-18177. We are proud to have had the opportunity to collaborate with OSEA on this wonderful event and for the opportunity to introduce them and their amazing work into the DUKE Heights BIA. This is a partnership that we plan to expand on in the future to continue to bring to our members some of the best options and alternatives in the sustainable energy industry.